The operating equipment in steel mills must be rugged and sturdy to withstand exposure to heat, metal debris, and coolant chemicals. One of the critical machines in a steel mill application is the pinch roller, which moves molten steel material between milling devices. Because such transport is critical in keeping the work moving, and requires heavy duty machinery to do what couldn’t be done safely by hand, an efficient mill needs reliable supplies to keep pinch rollers in service.Major steel producer, was experiencing high failure rates with hydraulic hoses supplying a water-glycol solution to the pinch roll machinery. Because rubber is a flexible product often in use for fluid transfer, it was one choice for thAe steel mill application, but it couldn’t hold up to the heat, both in the mill’s environment and particularly in proximity to the continuous casting process that the pinch roller was feeding. The next material the steel producer tried was a metal hose, but in addition to heat fatigue, corrosion was a problem. Both materials (rubber and metal) were causing time-consuming and costly delays as failures resulted in equipment down time.Including the other side of the caster (the steel entry point). 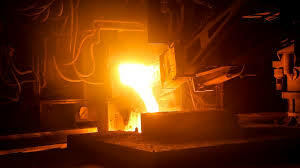 The ladle slide gate was also experiencing hydraulic hose failure due to extreme heat—approximately 260°C (500°F)—and the interaction with the hydraulic fluid itself. The variation of the hose for this application featured a PTFE inner core, metal braided exterior, and an insulating fire sleeve as a cover. These customized versions of an already heavy-duty hose product keeps the steel mill on target, meeting their efficiency goals as they know they can rely on the components that support their milling equipment.